"I'm here now, and I'm the same old daddy I was before." 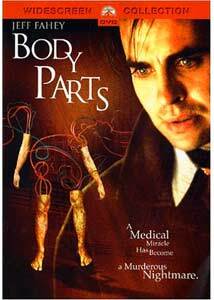 Body Parts is a nice looking but rather empty 1991 horror/thriller from director Eric Red, whose possible career highpoint was writing the screenplay for the Rutger Hauer nutball classic The Hitcher and co-writing Kathryn Bigelow's Near Dark. Those two at least stuck with you for a while when it was all over, whereas Body Parts look properly stylish and gory when need be, but lives and dies by the same blade that takes down many a potentially decent film�specifically, a story that fizzles when it should sizzle. Jeff Fahey plays a furrowed-browed criminal psychologist who loses an arm early in the film as a result of a rather nasty traffic accident. The whole accident sequence builds nicely, and is constructed pretty solidly by Red, with a wobbly spare tire serving as the focal point for the impending doom; it's a tense, fairly violent scene in a film that has more than a few. Thanks to what can only be termed a "radical" medical experiment, a new arm is successfully grafted onto his body by the stone-faced Dr. Webb (Lindsay Duncan), and unbeknownst to the patient or his wife (played by Kim Delaney) the arm belonged to a former serial killer. In the tradition of the potentially silly "limbs with a mind of their own" genre, Body Parts has to take itself very seriously, with Fahey having to occasionally fight back for control over his new wing, during things like the obligatory near strangling of his son or, better yet, a bar fight gone haywire. And as the story plays out, it seems that the good Dr. Webb maybe wasn't so good after all, having parceled out a number of leftover parts from the very same serial killer to a number of different patients. A film like this requires the wholesale acceptance of the ability of medical science (or at least one daring doc) to graft on new limbs in order to remotely succeed� and in one instance an ever bigger experiment�so if you're unwilling to swallow that pill Body Parts will be a struggle. Fahey doesn't get much to do until the bloody final reel, with most of his time spent looking quite serious and concerned, and when he finally hooks up with a wacky painter (Brad Dourif) he at least has someone to work off of. There are a handful of nicely assembled sequences in Red's film, offering some palpable suspense and acceptable gore levels, even though the audience already knows the new limbs are trouble from the get go. It just take Fahey and company 90 minutes to come to the same conclusion. Image Transfer Review: Paramount has issued Body Parts in 2.35:1 anamorphic widescreen, and the transfer ends up being a decent one. Colors are flat, but that appears to be at least somewhat of an intentional effect by the director, in order to establish a mood. Minimal specking, and no major compression issues to contend with. Audio Transfer Review: Paramount serves up a beefy 5.1 Dolby Digital surround track as the main course, supported by a tolerable 2.0 surround track as backup. The 5.1 track is the preferred choice, and it delivers when needed, with scenes like Fahey's traffic accident or a third reel car chase sounding appropriately loud and boomy. Rear speakers get used frequently to good effect, as well. Extras Review: No extras, other than 12 chapter stops and English subtitles. A stronger story could have really helped out here, because Red already has the visual element down pat. A movie about a new arm with a mind of its own can easily border on the comical, and though this one manages to keep things grim and somber, there ends up being not much for the main character to do until the last ten minutes.